Since my initial review of the Dynamo 34SE in 2015, the amp has undergone several significant revisions. On balance, the Mk. II version of this low-cost SET amp ($1495, 8Wpc) should be thought of as nothing less than a Dynamo on steroids. For starters, it has put on some weight, tipping the scales at 30 pounds, an eight-pound increase from the original, due mostly to the beefed-up power transformer. The chassis has been upsized and properly braced to reduce resonances. The 5U4G rectifier is gone, replaced by a 5AR4, which by virtue of its indirectly heated filament provides for a gentle high-voltage start up. This is a good thing, and I’m happy to report that, unlike my experience with the 5U4G, the 5AR4 worked flawlessly. Power supply filter capacity has been increased by 70% and capacitor voltage ratings have been doubled for increased reliability. You get all this for only a $200 increase in the retail price—now that’s something worth writing about. Otherwise, the basic design remains unchanged. The input signal is routed through a 100k-ohm pot to a voltage gain stage, a 6SL7 dual-triode connected in parallel. At the output you have a single triode-connected EL34 per channel, and no global feedback. 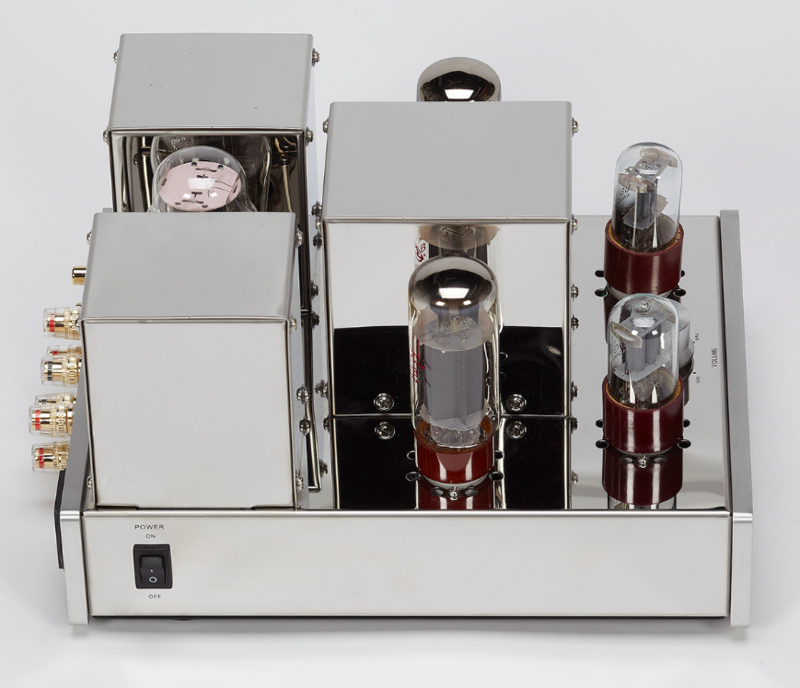 Although it was introduced circa 1954, the EL34 took off commercially in the high-fidelity market in 1959 with the launch of the Dynaco ST70, which went on to become a tube audio icon. The EL34 also became popular in guitar amp circles when Marshall switched from the KT66 in 1966. It is well known that the Marshall was one of Pete Townshend’s and Jimi Hendrix’s favorite amps, and for a good reason. The combination of a bluesy midrange and tight bass is hard to ignore. Some of you may be wondering if a triode-connected EL34 sounds as good as a true filamentary power triode such as the 300B. In a no-feedback design, single-ended distortion products have no place to hide, and in my experience each output tube is bound to display a distinct sonic signature. While the triode-connected EL34 lacks the textural refinement and civility of a 300B, it makes up for it with a lively character that infuses the music with dynamic tension. And that’s a tradeoff that I’m happy to live with. The Mk. II made for a far more favorable first impression than did the original Dynamo. The limitations I had previously noted at the frequency extremes were now far from obvious. This is a good time to explore the issue of speaker compatibility. J. Gordon Holt framed it perfectly many years ago: The problem with a power amplifier is that you can’t listen to it without using a loudspeaker and vice versa. The dilemma for any 8Wpc amplifier is the speaker interface. One obvious compatibility criterion is speaker sensitivity. I asked Coincident Speaker Technology’s Israel Blume for a recommendation regarding minimum speaker sensitivity. His answer: “Smooth impedance speakers of 86dB sensitivity should mate well with the amp.” Well, the 86dB criterion covers a vast slice of the speaker market. Almost every 6.5" woofer sports a sensitivity in the range of 86 to 88dB which pretty much defines the overall sensitivity of most two-way loudspeakers based on 6" to 7" woofers. While I definitely don’t regard 86dB as an ideal speaker sensitivity for this amp, I would acknowledge that it may well be adequate, providing that one’s expectations about ultimate dynamic range are scaled back. The Watkins Stereo Generation Four neatly fits the above criteria. Its 88dB sensitivity is complemented by an impedance magnitude that is about as smooth and benign as you can expect from a bass-reflex design. I was particularly eager to try out this coupling, in view of the pricing parity and the potential for a sub-$5k system recommendation. As mentioned above, it was apparent that despite its low damping factor the Dynamo was capable of decent bass definition, exceeding the performance of the more expensive Rogers High Fidelity 65V-1 integrated amp (reviewed in this issue), though its voicing was drastically different. The 65V-1’s EF86 front end confers a darker tonality with rich and intense chocolate-flavored textures. The Dynamo’s stock Chinese 6SL7, on the other hand, sounded fairly bright and lacking in tonal warmth. This made for a mismatch with the Watkins speakers which are already tilted toward the yin end of Harry Pearson’s yin-yang tonal spectrum. The obvious possibility that came to mind was a vintage 6SL7 substitution. They’re fairly cheap, even cheaper than the Russian new-production Tung-Sol reissue. Rolling in a pair of the Russian Mullard reissue EL34 pentodes helped to significantly smooth out textures, but did nothing to obviate the dry character of the midrange. Vintage Sylvania and RCA 6SL7s were reasonably effective in this regard. But actually the inexpensive Russian 6H9C (black base), a 6SL7 equivalent available from the Tube Store, painted the more vivid and lush midrange in this context. What a pleasant and affordable surprise! At this point I felt that the Gen Four and Dynamo complemented each other nicely. The Gen Four’s stupendous soundstage was fully fleshed out with the sort of image palpability single-ended triode amps are famous for. Dynamic nuances came alive. The Dynamo was able to hold together large-scale orchestral works without loss of detail or transparency. The surge from soft to loud was sure-handed and made me forget that I was listening to a mere 8Wpc amp. The Dynamo was obviously able to muster significant peak power on demand and managed to sound dynamically more like a 20Wpc amplifier. The lower midrange was portrayed with sufficient clarity and weight to do the majesty of the cello justice. In particular, Jacqueline du Pré’s rendition of the Dvořák and Haydn cello concertos [EMI CDC-7 47614 2], recordings I listen to frequently, came across with a verve that is often lacking with solid-state amps. There were performance limits, mainly audible as compression and strain when the Dynamo attempted to scale the dynamic range from loud to very loud, so it made sense to explore a more efficient speaker load. The OB3 DIY speaker, at 94dB sensitivity, has proven to be a near ideal match for low-power amplification. Featuring an open-baffle design and a wide range twin-cone driver, it seems to thrive on a few good watts. In this context, when partnered by a high-sensitivity speaker, the Dynamo really blossomed and showed no fear of dynamic material. It graced the music with a kinetic drive and a superb sense of pace. The overall presentation could best be described as relaxed with no harsh edges. The essential big tone character of the OB3 was preserved and highlighted the power range of the orchestra. The irony of the Dynamo Mk. II is that it is at least twice as good as the original for only a $200 price increase. Now that’s simply an insane situation. It not only captures much of the magic of a single-ended triode amplifier at an entry-level price, but it competes effectively against amps costing twice as much. An enthusiastic two-thumbs up recommendation. Dimensions: 9.5" x 7" x 12.5"